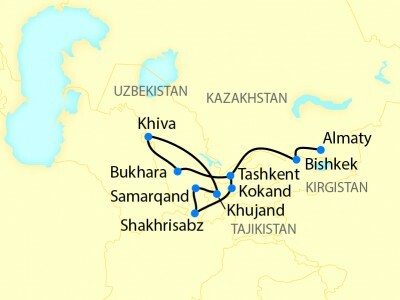 Travel on the luxurious Orient Silk Road Express private train from Almaty to Tashkent and experience the intricate and vast beauty of the great Silk Road. See monumental remains of great empires along the world’s most famous trade route, an ancient center of commerce and civilization across three countries and seven UNESCO World Heritage sites. Choose from four comfortable cabin types: Habibi, Ali Baba, Aladdin and Kalif, with Kalif being the most luxurious with private en suite facilities in each cabin. 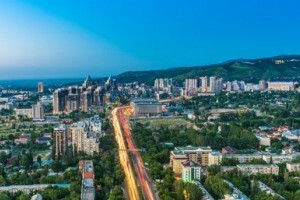 Almaty is the former capital of Kazakhstan, and is still its largest city. 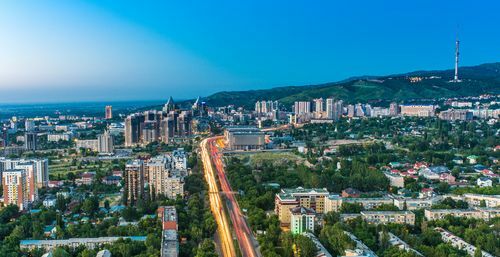 Being a financial and cultural center of Central Asia, Almaty offers plenty of entertainment and cultural opportunities and is a wonderful gateway to this distinctive and hospitable country. You arrive in Almaty and are transferred to your centrally located hotel. Overnight: Rahat Palace Hotel (or similar). In the morning, you enjoy a sightseeing tour of this green metropolitan city at the foot of the mighty Ile Alatau Mountains. You see the imposing Zenkov Russian Orthodox Cathedral, built entirely of wood, the Wedding Palace, the Almaty Circus, and the Central Mosque. At midday you are served a Kazakh welcoming lunch in a traditional yurt. You depart aboard your private train in the afternoon. Porter service guarantees the transfer of your large luggage directly to your train compartment. You are welcomed aboard the train with a drink or refreshment and a short informative talk. Overnight on board. Meals included: breakfast, lunch and dinner. You arrive at Lake Issyk-Kul in the morning. A bus transfer takes you to Tscholpon Ata, where you enjoy a boat ride on Lake Issyk-Kul which is known as the second largest mountain lake in the world. Afterwards you go on an excursion to the mountains including picnic lunch and Kyrgyz folklore performance. In the evening your private train departs for Bishkek. Overnight on board. Meals included: breakfast, lunch and dinner. After breakfast on board you arrive in Bishkek, the capital of Kyrgyztan and located at the Tian Shan mountain range. During your city tour you visit the bazar and the National Historical Museum and also experience the Ala Archa National Park during an excursion in the afternoon. In the evening, your private train departs for Tashkent in Uzbekistan. The border formalities are taken care off on board. Overnight on board. Meals included: breakfast, lunch and dinner. Your private train arrives in the early morning at the Uzbek capital of Tashkent. 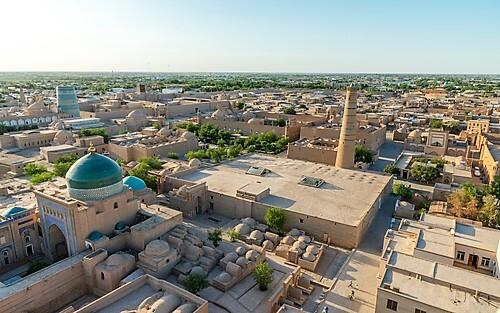 On your sightseeing tour of the city you are able to have a look at this green oasis in the steppe and see the Madrassa Kukeldash, the Kavoj and Amir Timur monuments, and the typical mud brick houses. In the evening you attend an opera or concert in a music hall (programme permitting). Overnight: Grand Mir Hotel (or similar). Meals included: breakfast, lunch and dinner. After breakfast you cross the Kamchik mountain pass with your private train. 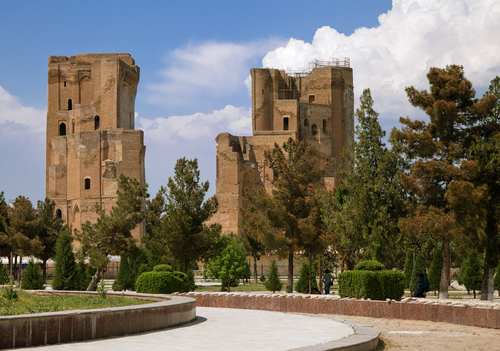 In the afternoon you reach the city of Kokand which once was the capital of an Uzbek kingdom – the Khanate of Kokand –and visit the Palace of Khudayar Khan. 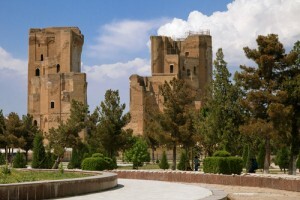 Upon completion it was one of the largest and most opulent palaces in Central Asia. You also have the chance to visit a local family and help with the traditional baking of bread. Overnight on board. Meals included: breakfast, lunch and dinner. During the night, your train passes through mountainous territory. The Greek heritage has been preserved in this inaccessible mountainous region and cultural influences of the Bactrians and the Kushan Empire also survive here. Fire worship and shamanism are still practiced here in the form of rituals and myths seldom found elsewhere. Trade caravans once travelled through these narrow mountain gorges and the armies of Alexander the Great, Genghis Khan, and Timur (or Tamerlane) also passed by here. A traditional ceremony offers you first-hand insight into the region’s unique folklore. 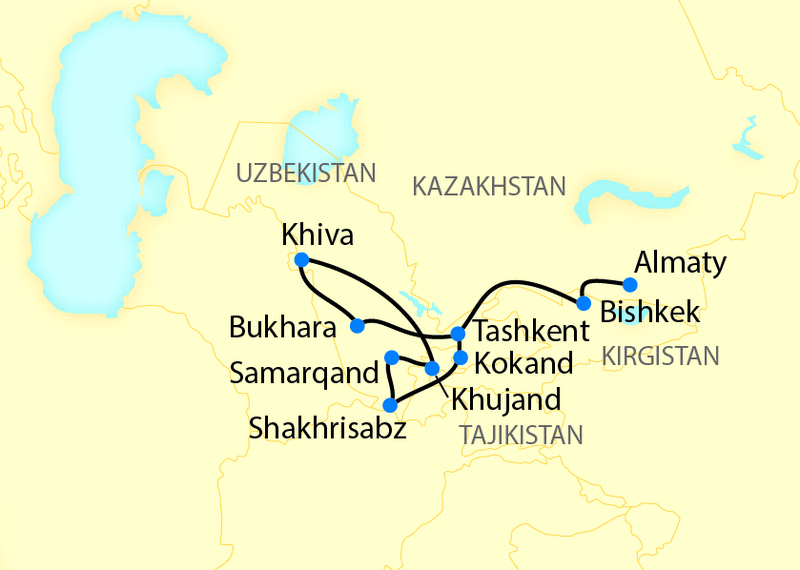 Your journey then continues along the Great Silk Road aboard your train to the green city of Shakhrisabz, the birth place of Timur. Your sightseeing here includes the monumental architecture of the brutal Mongol ruler’s great palace from the fourteenth and fifteenth centuries. In the evening you depart for Samarqand on your private train. On board you are invited to a tasting of Uzbek wines. Overnight on board. Meals included: breakfast, lunch and dinner. Today is spent visiting the sights of this famous historic city, which during the rule of Timur was considered the world’s most beautiful and prestigious city. The Necropolis of Shah-e Zinde (the living Shah), the excavation sites at Afrosiab (with a museum tour), and Registan Square are certainly among the most notable architectural ensembles in Central Asia. It is also historically important, as the site where many Uzbek women burned their veils (paranjas) in 1917, to signal their arrival in a new era. Overnight: Registan Plaza Hotel (or similar). Meals included: breakfast, lunch and dinner. 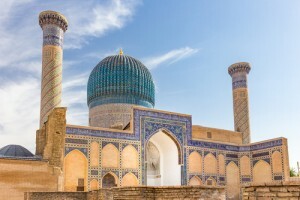 Your day in this fascinating city includes a tour of a silk carpet manufactory, a visit to an Uzbek craftsman’s family to see paper being made from mulberry bark, stops at the Ulug Beg Observatory and the ruins of the Bibi Khanum Mosque, and viewing the interior of the palace-like Gur Emir Mausoleum. Overnight: Registan Plaza Hotel (or similar). Meals included: breakfast, lunch and dinner. 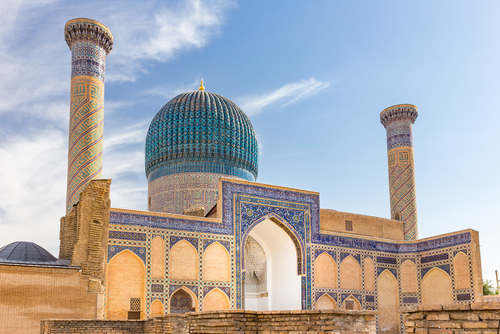 The morning is yours to explore Samarqand or spend as you please. Your train departs for Khujand in Tajikistan around noon. Overnight on board. Meals included: breakfast, lunch and dinner. In the morning you arrive in Khujand, formerly known as Leninabad and now the second largest city in Tadzhikistan. Your city tour includes visits to the old citadel, mosque and bazar. You will also meet a Tadjik family. In the afternoon your train continues its journey westwards. Overnight on board. Meals included: breakfast, lunch and dinner. 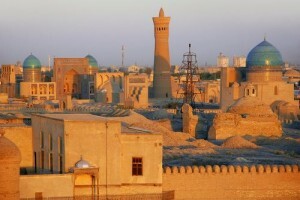 Today you will visit the oasis of Khiva, a fairy tale from 1001 Nights – in stone. Standing at the mighty town wall with its gates and bastions of mud brick you feel transported into another world. On your sightseeing tour of the oasis you have a chance to take in its exotic atmosphere. Its palaces, mosques, minarets, mausoleums, and madrassas (Muslim religious schools) represent one of the best preserved ensembles of medieval oriental urban architecture in the world. You enjoy lunch in the surroundings of the former emir’s Summer Palace. Overnight on board. Meals included: breakfast, lunch and dinner. Located in the middle of the Kyzylkum Desert, Bukhara has some one thousand architectural monuments recalling the golden age of the Great Silk Route. Exotic spices, furs, and especially silk were stored and traded then in the city’s caravanserais. In Bukhara’s Old Town (UNESCO World Heritage), you see the almost fifty-metre tall Kalyan Minaret and the Lyab-I Hauz Ensemble by the pond. In a madrassa courtyard you watch a performance of local dances, and a presentation of colourful national costumes with musical accompaniment. Overnight: Hotel Asia Bukhara (or similar). Meals included: breakfast, lunch and dinner. Bukhara, which also bears the by-name Sherif (the noble one), has preserved its ancient oriental countenance in its extensive, unparalleled collection of authentic architecture. 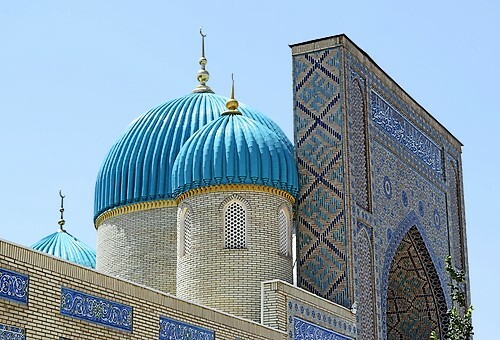 In the morning, we drive you to the splendid Mir-e-Arab Madrassa and the Samanid Mausoleum, one of Central Asia’s most beautiful architectural treasures. Afterwards you tour the massive Ark Citadel, a city within a city that was once the seat of government of Bukhara’s former rulers. There you view the Throne Room, after which you visit the last emir’s Summer Residence. Overnight: Hotel Asia Bukhara (or similar). Meals included: breakfast, lunch and dinner. 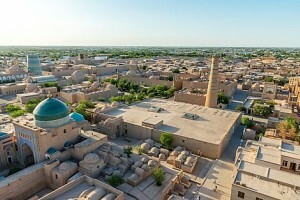 In the morning you can enjoy leisure time in Bukhara, until your Private Train departs for Tashkent around noon. In the afternoon you will arrive in Tashkent. Overnight: Grand Mir (or similar). Meals included: breakfast, lunch and dinner. After breakfast, you transfer to the airport. Meals included: breakfast. Would you like to add extra night in Almaty?